Need a fresh idea for a packed lunch? 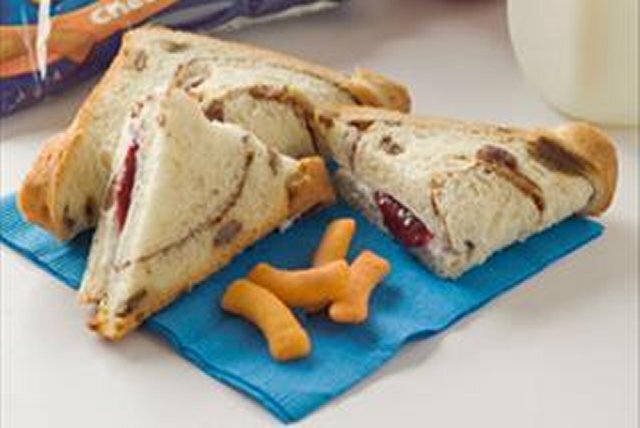 Give our Cinnamon Raisin Fold-Over Sandwich a try - it’s a simple twist on a jam sandwich that is sure to shake up your sandwich routine. Spread centres of bread slices with cream cheese product, then jam. Serve with 1 Kraft aMOOza! Twists Cheese Snack, an apple and 1 carton (250 mL) cold skim milk. This great-tasting sandwich can be part of a healthful eating plan.